Champions, as the familiar adage preaches, are not born—they're made. Reaching the top of any sport, or any aspect of life, takes years upon years of dedication and proper preparation. But if there's a huge pool of individuals who have undertaken the same commitment and steps towards becoming the best, what truly separates the winners from everyone else? Joanna Zeiger believes proper mental preparation is the answer. The Champion Mindset is a much-needed and long overdue look into how to program a competitor's mind to achieve optimal success. Changing behaviors and ways of thinking are never easy, but the chapters in this book aim to simplify this process to make it manageable and achievable. This book is for every athlete—from the weekend warrior, who wants to complete in his or her first 5k running race, to those who have aspirations of one day becoming Olympians and world champions. The Champion Mindset is a compendium of Zeiger's own personal journey from struggling novice swimmer to Olympian and World Champion. 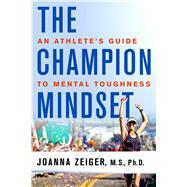 Through steps including: Proper Goal Setting, Keeping it Fun, Building Your Team, Intention in Training, Improving Motivation, Promoting Self-Confidence, and Mind/Body Cohesion, among others, Zeiger uses her decades of personal experience, doctoral-level research, and professional success, to prepare readers to go all-in with their mental game. JOANNA ZEIGER, PhD. is an accomplished Olympic athlete, researcher, and coach. She placed 4th in the Sydney Olympics and was the 2008 Ironman 70.3 World Champion. She excelled at all 3 distances in the sport of triathlon, winning races in the Olympic, Half Ironman, and Ironman distances. She is a 7x Olympic trials qualifier in marathon, triathlon and swimming. The Champion Mindset is her first book. She is the co-creator of Race Ready Coaching.